FiberTite Adhered Roofing System Protects Prized Artifacts at National Museum. The Steven F. Udvar-Hazy Center near Washington Dulles International Airport, together with its companion facility, the National Air and Space Museum on the National Mall in Washington D.C., display the largest collection of air and space artifacts in the world. The Space Shuttle, Enterprise, the Gemini VII space capsule, and the Lockheed SR-71 Blackbird, the fastest jet in the world, are among the unique aviation treasures showcased here. The new wing of the Udvar-Hazy Center museum, added in 2009, is dedicated to caring for, restoring and preserving the air and space objects on display at the museum. 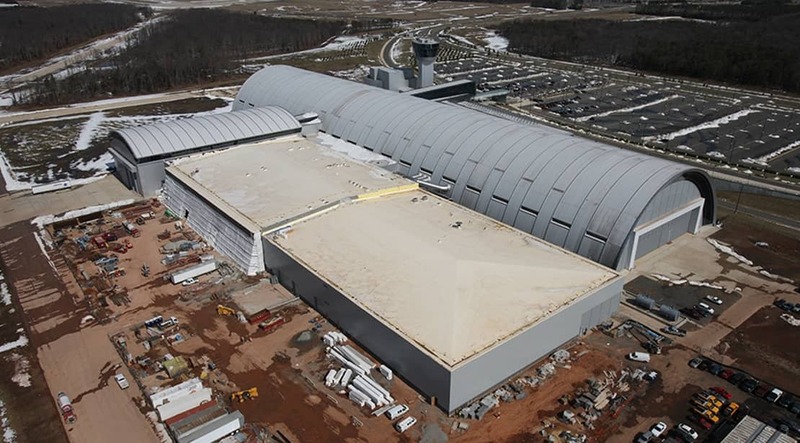 A 50 Mil adhered FiberTite Roofing System by Seaman Corporation protects the new wing and keeps the prized artifacts held within the 1.5 million square foot Phase II expansion dry. Located at the foot of two major runways, the museum’s rooftop is subject to jet fuel fallout from descending and departing airplanes that pass just 150 feet above the facilities. FiberTite offers a proven track record of durability and long-term performance, particularly in airport environments where attributes like resistance to jet fuel and high winds are truly tested.